I bought the A330 DVD recently, and it was fantastic. The service from ITVV was first rate as always. I was luck enough to 'fly' an A330 simulator at Alteon in Manchester lately, so this DVD brought it all back to me. My sincere thanks to Julian Bond and Mark Haley, and of course ITVV, for a unique and very interesting DVD. Great value for money, and an excellent DVD. Ordered this on a Friday and received it the next day, absolute fab service. Shows you everything you want to know, next one I buy will be the Virgin 744. This is an absolutely first class DVD - well done! The picture/sound quality is first rate, and the quality of production is superb. There are several camera angles to keep things interesting, and even shots with the ground crew at Manchester and shots on the ground for the arrival in Florida. 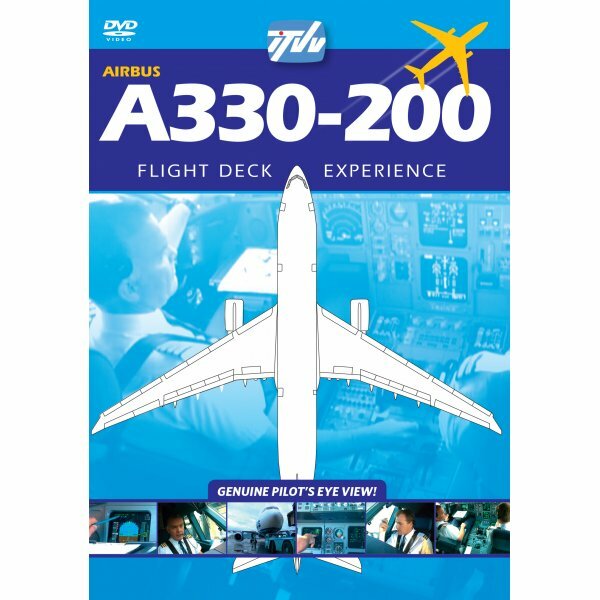 I recommend this DVD without hesitation to any aviation fan. I've had this programme for 2 years and i must say its a great programme to watch. Julian was my pilot this summer from Glasgow to Larnaca was nice to meet him in person. I now have a collection of four programmes so far and this is my favorite. I love the A330 and Captain Julian Bond explained it all very well. Captain's explanations very easy to follow. Well presented, Capt. Julian Bond is excellent and his explanations easy to follow. Thoroughly enjoyed it and will buy more. Its one of those DVD's you have to watch over and over again. As I watch it I feel as though am actually there flying this incredible aircraft.... I wish! Well worth every penny, I shall buy more!! My first programme from ITVV. I really enjoyed it. I've just finished watching this programme for the fourth time and it is just as good as the first. I've now got a large collection of ITVV programmes and this is the best, only marginally beating the Virgin 747-400. Well done on this great programme. The A330-200 is a very high tech and economic aircraft and this surely proves the point when watching the programme. The A330-200 looks very sleek in the Airtours colours but this programme is amongst the best to watch for those airbus enthusiasts. If you were to buy any programme from this site, make sure it's this one. I'm hoping to make it as a pilot one day, and watching this programme really helps you to understand what is involved in flying. This is an excellent programme. I work at the Orlando-Sanford Airport and it was very nice to see the airport featured so nicely and be able to see and hear several of my co-workers on this programme. For someone who works with Airtours (now MyTravel) it is quite interesting to see what happens after the aircraft pushes back from the gate. I watched this programme almost I think Five times and this is indeed a Fantastic Programme. Captain Julian Bond has given a very Nice overview of all the on board systems in very neat and understandable language. His way of explanation is very good and makes everything to the point. You get to know the some differences between A320 and A330!! You are also able to go through the Pre-flight Briefings, Checklists and for some time observe how the Crew accomplish their tasks with Real ATC Voice in the background. THIS IS THE BEST PROGRAMME FOR ALL AIRBUS LOVERS!!! I love this programme just watched it for the 2nd time, the captain gave the best description of the airbus I have seen so far. Really enjoyed the A330 programme. I have been a customer since 1992 and have all your programmes. They are excellent. I was very pleased with the programme. By far the best programme yet! (GO B737-300 being a close second!). Captain Julian Bond's description of the EFIS and MCDU made a complex subject easier to understand. I also enjoyed listening about Julian's career in flying and the route to pilot such an incredible aircraft. Great approach briefing/detail and interesting to see TCAS in operation. Absolutely stunning programme, which is worth every penny. I can only highly recommend it to any aviation lover, but also to people that are not that much into aviation cause everything is explained so well. I love those programmes! Keep up the good work! I was stunned when I saw the lack of flight controls. The joystick is on the Captain's left hand!! This discovery made me on a recent American Airlines flight from the Dominican Republic to LA to ask permission after landing in Miami and LA to enter the flight deck. I had the thrill of my lifetime when I was able to spend significant time on an A-300 and 757's left hand seat while at the gate. This is a superb programme. Good camera views and especially the Captain who knew how to explain difficult things to others. This is really a superbly made programme. all the different procedures are explained by the Captain. I especially like the see through charts and check list they are really well presented and the multiple camera shot for take off and landing are great.